The sanctuary echoed with hundreds of voices singing, “His love endures forever!” A deep voice thundered the words from the seat behind me. A well trained soprano harmonized from across the room. The words were barely audible from the heartfelt whispers of the frail, elderly woman beside me. As I listened to the praises of the young, the old, the broken and the joyful, I was overwhelmed by the reality of God’s faithfulness to mercifully inhabit our unworthy hearts. Thousands of years ago, there was another sanctuary filled with similar praises from the lips of God’s servants. After seven years of diligent and meticulous labor, Solomon’s workers completed the construction of the Lord’s glorious temple. With joyous expectation, the elders and priests gathered together to give thanks and dedicate the magnificent structure. The trumpeters and singers joined in unison, as with one voice, to give praise and thanks to the LORD. Accompanied by trumpets, cymbals and other instruments, they raised their voices in praise to the LORD and sang: "He is good; his love endures forever." Then the temple of the LORD was filled with a cloud, and the priests could not perform their service because of the cloud, for the glory of the LORD filled the temple of God. The presence of God descended in a cloud, filling every crevice of that temple with His awe-inspiring glory. The instruments were silenced. The praises ceased. The Spirit of the Living God so overwhelmed His servants that they were unable to stand in His presence. What had simply been a spectacular building was instantly transformed into a sacred temple. It is not our worthiness that woos our heavenly Father to the temples of our hearts. It is His abundant mercy. According to The Bible Knowledge Word Study: Joshua-2 Chronicles (Cook), The Hebrew word translated “love” in the worshippers’ song (2 Chronicles 5:13) refers to the mercy and kindness God faithfully bestows upon His covenant people. As Christians, we come before a holy and righteous God only by the covenant blood of His beloved Son. It is God’s mercy that brought His son to earth. It is His mercy that sustained our Lord on the cross. It is God’s mercy that makes a temple worthy of His holy presence. Beloved, regardless how ordinary or unworthy you may feel, by the cleansing blood of Jesus Christ and the indwelling of His Spirit, you have been mercifully transformed into a sacred temple of a Holy God. Are you compassionate toward people in need? I did a word study on the word, "compassion." I felt a little convicted as I was reminded that compassion is more than a feeling. There are several different Greek words that are translated "compassion" in the New Testament. As I studied, I noticed there was one particular Greek word used throughout the gospels to describe Jesus’ response to people around him. The word is, splagchnizomai. It means, “to have the bowels yearn, i.e. (fig.) feel sympathy, to pity: - have (be moved with) compassion (Strongs).” It is a heart response felt deep in the gut that compels us to action. Moved by compassion, Jesus healed the sick (Matthew 14:14), cleansed the leper (Mark 1:41), taught the crowds (Mark 6:34), raised a widow’s son from the dead (Luke 7:13), and miraculously fed the multitudes with seven loaves of bread and a few small fish (Matthew 15:32). In every instance, the compassion Jesus felt deep within Him, compelled Him to take action – to eliminate pain or help the needy. If anyone has material possessions and sees his brother in need but has no pity on him, how can the love of God be in him? Dear children, let us not love with words or tongue but with actions and in truth (NIV). Christ-like compassion is expressed when we go beyond simply telling others that we care by taking action to help them. I have several reference books on Jewish history and traditions (one of my favorite topics!). I was interested to read that Jews have always had a strong sense of responsibility toward the poor and needy in their communities. Perhaps we can learn a little about compassion from our Jewish friends. Jesus was a Jew, you know! 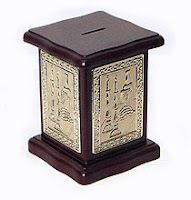 A tradition that I found fascinating is the use of a small collection box called a pushke (or charity box). Jewish families begin teaching their children about the importance of regular, charitable giving through the use of small charity boxes. A collection box is kept in the home and used by all members of a Jewish household to deposit loose change on a daily basis. The money colle cted in the box is given to the poor or to a type of benevolence fund at their local synagogue. The presence of the charity box encourages young and old alike to cultivate the habit of giving to others without counting the cost. After my research, I ordered a charity box for our family. Compassion isn’t a feeling. It is a heart response that compels us to action. How does your family cultivate a habit of giving and reach out to the world around us with Christ-like compassion? I’d love to hear what you’re doing! Please share by posting a comment. After living in our home for ten years, we finally granted our Family Room and Foyer a badly needed coat of fresh paint. I felt a little trepidation as the painters invaded our usually quiet home with a flurry of activity. Armed with a variety of ladders, neatly folded drop-cloths, spools of plastic , and paint buckets filled with our carefully selected colors, the diligent crew of workers began moving furniture and preparing our home for transformation. Once they settled into their work, I poured a fresh cup of coffee, chased down our one-year-old Yorkshire Terrier, Mollie (who was curiously inspecting the painters supplies), and closed myself into the master bedroom to do a little research for a lesson that I was working on. I spent the majority of the day confined to the bedroom, but as the painters were nearly finished, I cautiously stepped out into the foyer. The rich colors brought new life to our ten-year old walls that had previously sported a drab shade of beige. I was surprised how much a fresh coat of paint and a change of color could transform our surroundings. I enjoy spending time in our “new” Family Room. Interestingly, I had a similar experience recently when I began utilizing different versions of the Bible for my prayer time. I often read a Proverb and pray passages as I feel convicted or inspired by the content. Although I typically memorize passages and teach from the New International Version, by changing translations during my quiet time, I find that my time in God’s Word is enhanced and my prayers have more depth. I encourage you to try reading from different versions of the Bible during your prayer time. I’ve collected a number of different translations over the years and always get excited when I am able to add a new Bible to my collection. Post a comment and tell me your favorite version of Scripture. If I don’t have it, I’ll be sure to place it to my list of Bibles to add to my collection! Have you ever asked God Why? “Why does He allow His servants to suffer?” “Why do cheaters often appear to win?” I must admit, the more answers I stumble upon in my journey of faith, the less I seem to fully understand. God uses the unqualified and exalts the meek. He cures some people from terminal illness and heals others by ushering them to Heaven. In wrestling through the whys in my life, I’ve often thought I might do things differently if I were God. I’d probably choose the strongest and most influential folks to carry out my work. Certainly I’d only select leaders with unwavering faith and steadfast obedience. Criminals would always suffer and the righteous would always prosper. Yes, I might have created a world without annoying ants, creepy cockroaches (there’s a why! ), or the nuisance of bees, but in my diligence I would have produced a planet without amusing creatures like anteaters, the beauty of flowers, or the sweetness of honey. For my thoughts are not your thoughts; neither are your ways my ways, declares the Lord. As the heavens are higher than the earth, so are my ways higher than your ways and my thoughts than your thoughts (NIV). I do not always understand the ways of God. But I marvel at the beauty He frequently generates from the ashes of tragedy. I am continually amazed that He so often chooses mercy when others might opt for wrath. And I am continually in awe of His ability to transform the rebellious and restore the broken. Copyright 2009 © Fruitful Word Ministries, Inc., All Rights Reserved. For a moment, I wondered why the petite, middle-aged woman driving the car would have applied the sticker improperly. Surely she recognized that other drivers would have a difficult time reading the awkwardly displayed sign. But as I gave the scenario more thought, I realized that the woman hadn’t applied that sign to her window for other drivers. She had displayed the sign there for herself. It was positioned slightly off center so that it could be seen (and easily read) every time she glanced into her rearview mirror. I felt an immediately sense of kinship with this unknown woman. I too have experienced seasons in my life when I needed visual reminders of God’s goodness amidst circumstances that were exhausting or deeply painful. There have been times when I’ve written Scriptures that speak of God’s faithfulness on my hands, on my vanity mirror, or even taped to the dashboard of my car. Passages like, Know therefore that the Lord your God is God; He is the faithful God, keeping His covenant of love to a thousand generations of those who love Him and keep His commands (Deuteronomy 7:9) have helped focus my thoughts on God’s goodness when my circumstances were not so good. As the traffic light changed from red to green and we drove in different directions, I lifted up a prayer for this mysterious woman who chooses to keep God’s goodness ever present in her rearview mirror. I would imagine her focus on the goodness of our God will give her the strength she needs to make her way through whatever challenges lay ahead for her. You may not want to paste a sign on the rear window of your car, but during seasons of disappointment or trial, I challenge you to write passages that speak of God’s goodness and faithfulness in prominent places in your home, your car, or your workplace. You'll find strength and courage for whatever the road of life may bring. If you have some passages that you use to remind yourself of God's goodness, I encourage you to share them by posting a comment. Our family took a short trip to kick off the new year. 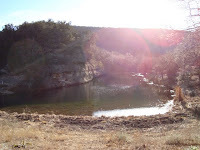 We stayed in some quaint little rustic cabins, nestled in the heart of the Texas Hill Country. Our son, Brandon, brought along his girlfriend (they stayed in separate bedrooms, of course), so needless to say, we had a full cabin. My mother, sister, my thirteen year old niece and eleven year old nephew joined us, staying in a near-by cabin on the same property. Without the distractions of television, cell phones, and the world-wide web, everyone was forced to occupy themselves with more primitive forms of entertainment. We played cards, read, and just talked as we sat on the deck under the starlit sky. It warmed my heart when frequent laughter and competitive shouts erupted from the cabins as the younger crew played card games until the wee hours each night. My husband, Mark, provided comedic relief with his unsuccessful, yet persistent efforts to convince the kids that a wild animal was invading the grounds. 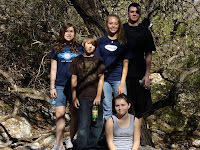 This is a photo of the kids. Fun was had by all! The weather was extraordinarily warm – in the upper 40’s at night and low 70’s during the day – which made for a beautiful hike at a near-by state park. The first couple miles of the hike were intense, with a steep incline to the hilltops, but the view at the top was breathtaking…okay, we were out of breath from the hike, but it WAS beautiful. 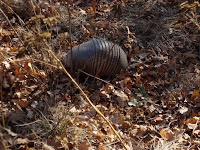 As we made our way down the other side of the hillside, we were surprised to see a LIVE armadillo beside the trail - only in Texas! It was a wonderfully refreshing way to begin the new year. We all need times of rest and refreshment. After the apostles went out and preached and ministered among the people, they "gathered around Jesus and reported to him all they had done and taught" (Mark 6:30). Jesus urged them, “Come with me by yourselves to a quiet place and get some rest.” (Mark 6:31). We’ve visited FoxFire Cabins several times throughout the years when our family needed time away to rest and reconnect with one another. Please share a little about the quiet resting places God has provided for you or your family by posting a comment.